Whisk together olive oil, lemon juice, honey, dijon and salt in a bowl. Pour 3/4 of the dressing over kale and toss until kale is evenly coated. Massage dressing into kale to help soften leaves. Add apples, quinoa, walnuts and cranberries. Pour remaining dressing over salad then toss. Add feta cheese and toss just lightly. Serve or store covered in refrigerator. This dressing is yummy on any kind of salad but it's especially delicious on a greek inspired salad! I love cooking with lemon zest (well all lemons in general)! With this dressing you get a hint of lemon without the citrus which works well with the red wine vinegar and olive oil base. Mix and pour over salad! If you need some salad inspiration try this dressing on my the amazing Butter Bean Salad! Let's Get Saucy! Healthy Alternatives for Flavoring Your Favorite Vegetables. Consider these options next time you're stuck on how to season a simple side dish or vegetables! You'll never need to buy another store bought pre-made stir fry sauce again! Simply cook in olive oil. Once al dente add sea salt and a squeeze of fresh lemon juice and violà! Amazingly flavorful! Shiitake Mushrooms - I first saw this recipe on Chef's Table on Netflix and have quickly adapted it into my own cooking on the regular. Add sesame seed oil to the pan and cook shiitake mushrooms until softened. Add tamari and you're done! Living in Boston I got hooked on all things buffalo sauce. This baked cauliflower tossed in buffalo sauce is where it’s at. It’s a healthy and satisfying change from my go to (and insanely unhealthy) chicken buffalo dip. 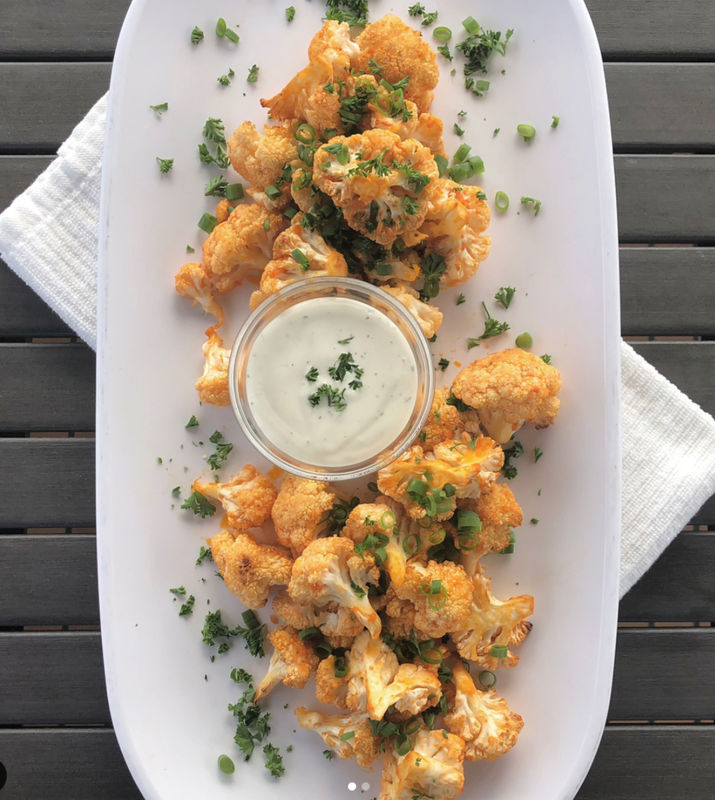 If you want that recipe too, DM me 😉 I’ve found that if you're a fan of buffalo sauce you can't go wrong with these tasty cauliflower bites. Makes as a great side or just as a snack! Melt ghee and combine with garlic and Franks hot sauce. Chop cauliflower into bite size pieces. Mix sauce with cauliflower in a bowl. Garnish with green onions and parsley. Place in a baking dish and bake for 20-25 minutes. For a more crispy cauliflower, remove any access water from baking dish after 18-20 minutes in the oven and broil for remaining time. Aioli sounds fancy but it's really just garlicky mayonnaise. It's delicious on seafood, grilled asparagus or as a condiment or spread. This recipe is adapted from Cynthia Lair's Feeding the Whole Family cookbook. I first made this recipe in Cynthia's Whole Foods Production class at Bastyr University. It is an easy recipe to make and works great for leftovers! Eat cold, hot or room temperature. Quinoa has an excellent nutritional profile with 10.5 grams of protein per cup. This unique whole grain, which was a staple food of the Incas, is also rich in calcium and iron. Rinse quinoa with warm water and drain through a fine strainer. Place quinoa, salt and water in a 2-quart pot. Bring water to boil, reduce heat to low, cover and let simmer 15 to 20 minutes, until all the water is absorbed. Tip pan to the side to make sure all the water has been absorbed. Let stand for 5 to 10 minutes uncovered, then fluff with a fork. Place cooked quinoa in a large bowl. Add carrots, seeds and parsley to quinoa. Mix thoroughly. Combine garlic, lemon juice, olive oil and tamari; pour over quinoa and toss well. Serve at room temperature or chilled.